For the 29th Drive, we initially planned #fillTheBucket project for the flood victims, but we thought since everyone was participating in that event, we should do something for people who are in need of our care and love. 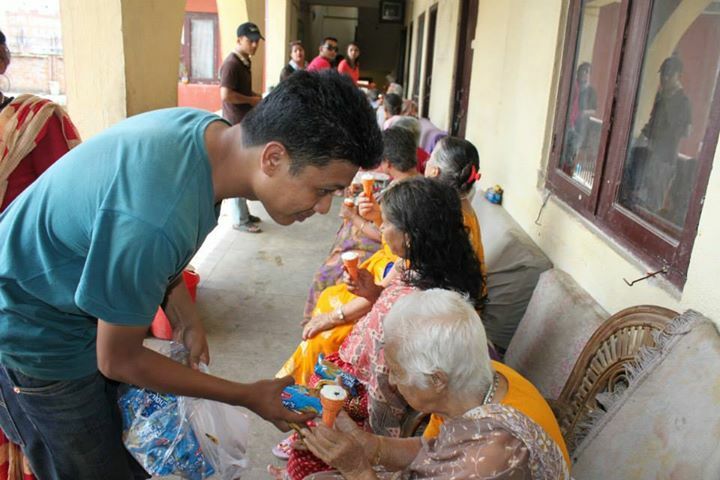 We decided to go to an Old Age Home in Tinkune, and do something for the elderly who stayed there. We brought some fruits, biscuits and ice-cream for them, and as we distributed they were very happy . It reminded me of the the times when we were kids, the joys that we got as our wishes were fulfilled by our parents. It was disheartening to see the elderly living by them self. The adults must be having their own reason to part from their parents but when I think about it there would be nothing in the world that would force me to leave their side. When people grow old they get back to their child like behavior as they need more attention and love rather than the financial help. We ignore the fact that the heights we have reached in our lives is built on the sacrifices and efforts of our parents. It is all about the circle, they have raised us with utmost pampering and protection, with being by our side each moment, it is our duty to give them back. What goes around definitely comes around. Even after staying in the old age home, we could see the love in their eyes for their children as they had come to visit them, a hope that their child will come to pick them up. It was one of the most touching event because of the way they treated blessed and spoke to us and not about the food items we could provide. We spent our time talking to them, giving them much needed company. It is rightly said “it’s all about love and not about money”. We felt so proud to have been able to bring smiles to the faces of many mothers and fathers in a span of an hour. The kids who have admitted them to an old age home have lost a chance, an opportunity of giving happiness to the one that loves them the most”.